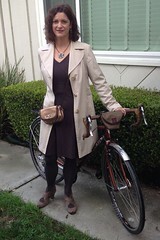 Why We Need a National Bike to Shop Day | One woman. Many bicycles. I’ve been doing all our grocery shopping by bike for years now. PRO: It’s fun to ride to store! A pair of Jandt panniers are sturdy, spacious, and easily loaded. One easily holds 6 bottles of wine when Safeway has a 30%-off sale. Plus I put breakables (e.g. eggs) or squashable (e.g. bananas / tomatoes) in a separate rack-mounted zipped pannier. Mid-town Safeway, which is close and has most of the food I want, has good bike racks. I hear you about unloading the bike carefully. My bike has fallen over a few times in front of my house. I have a good two-legged kickstand which helps immensely, but when you’re carrying 40 pounds spread across three locations on the bike you have to unload properly. 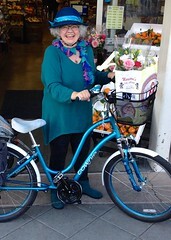 Bike to shop day is a great idea! I run little errands on my bike, usually just picking up a few things at the grocery or a making a quick trip to the drug store. The only other errand we normally have is the big weekly trip to the grocery store, and my spouse usually does that (using the car) on Fridays while I’m at the office. We do go to Costco about once a month, but it is way out in the suburbs and would require navigating a big highway, so we drive there. Good job! It seems like planners/advocates concentrate way too much on the idea of “bike to work”. Don’t get me wrong, I like the idea and do it, but for for some, it’s the only thing discussed. For example, a lot of bike counts are based on bike commutes to/from the central city or work hub, and a lot of bike routes are designed to/from central city vs cross town. Some people just live too far from work or have a wide work radius, so bike-to-work isn’t always practicable. (For example, my friend works in construction, so his daily commute could be anywhere between 1 to 100 miles.) But if the idea is to reduce the number of car trips, we have to look at other ways than just how people get to/from work. I haven’t owned a car in 14 years, so all my shopping has been by bike, and I’ve been managing just fine. So it’s good that we can show others it can be done too! “My” stores are on my route home from work. Fortunately I have an old Dutch bike with equally as old Dutch canvas panniers. The panniers hold two full size (like the green bags in your photo) grocery bags, plus the rear rack has a spring clamp that can hold a decent size box. Weather is never an issue (I’m in SoCal) even when it rains. The nearest stores are only 2 miles away. Congrats LadyFleur on putting together your Silicon Valley campaign. 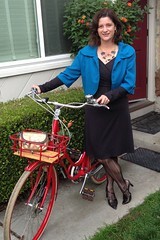 I applaud the Bike to Work Day efforts for how they’ve elevated the message that bikes are viable transportation. I wouldn’t want to stop or even slow down that effort. What I’m looking for is extending the bikes as transportation discussion to include the vast range of trips people make. The average American puts 15,000 miles on their car per year and only half of that mileage is their work commute. Clearly we need to do something to capture the other half of people’s transportation. This is a totally awesome idea and I’m sharing it at work! I’m lucky incidence of theft is pretty low so sometimes I just leave panniers with stuff in it on the bike while I go in for a quick trip. It helps if they’re covered. My laptop pannier is a Dutch design that has an easy on/off design so it’s not tough carrying it in the store. I have had lights stolen so I do pull those off. Fortunately they’re quick on/off ones too. A lockable trailer would be awesome, wouldn’t it? A lockable trunk/trailer/pannier is a brilliant idea! Is something like this available? I know of panniers you can lock to your bike, but not of ones that are themselves lockable. Love this! Are you familiar with Monterey-by-Bike? They offer discounts to bike riders in the Monterey area. Congrats on all your work to get the day started in your area – such a super idea!! 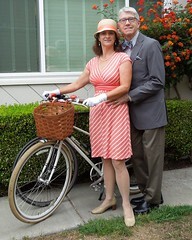 We do most of our errands and shopping by bike! Costco, Target, the grocery store, the garden store, you name it. We will go to extreme lengths to avoid using the car. This winter, the weather challenged us more than it ever has though. I’ve also been writing about bike parking (started with grocery stores) on my blog for years . Over time more retailers are seeming to ‘get’ bike customers a little more – but having a bike to shop day like yours would really help everyone get the message! On top of all that goodness, some shopping centers are SOOO much more accessible by bike than they are by car – Town & Country in Palo Alto, for example, is a horrific place to park. The amount of time it takes to wait in traffic to enter, navigate the parking lot, and wait to exit totally negates the time I would save during the drive! I even bike to Stanford Mall now because of the easier parking. And some advice from experience – buy a lightweight, reusable shopping bag from your favorite mall store rather than trying to stuff a heavy paper bag into your bike bag, or worse getting crumbs from your reusable grocery bag on your spiffy new clothes! Yes, a lot of people who shop by bike make more frequent trips. Given my bike can carry three full bags of groceries, I probably do about the same as I did by car. I do my main grocery shopping once a week with the high-capacity bike and often do a mid-week stop on my way home from work for things I forgot. Pretty typical. One thing I do differently is when I go to multiple stores on different sides of town I’ll often stop at home, empty my bags and go to the second store. It doesn’t add much mileage and it means I can stock up easier. Great day! You may need the power of your anger to bike away with the “tonnage” of groceries. Just kiddin’ . Bike on! The anger has been replaced by pride. Our team of seven volunteers has already signed on almost 40 shops and we have six weeks until the big day. I am very happy. That’s what I do. Whenever I get abuse “as a cyclist”, from wherever, I channel the anger into doing something constructive to change things for the better. I don’t bother wasting time trying to change one person’s mind (no matter how angry I am), I look at the larger picture and change the situation so that in the future people like that won’t even have their thoughts go in that direction any more. 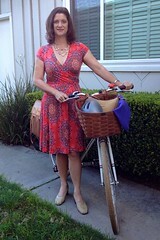 I like shopping at Nob Hill and Whole Foods by bike. Their racks are upfront, either the sidewalk in the front or the very first parking spot. I will not shop at Trader Joe’s by bike since the only bike rack is set back by the Baskin Robbins. And it really angers me that the new Target has it’s bike racks set back by the seating for the bus stop. Really? I haven’t seen any bikes in it yet, but plenty of people sitting on the racks smoking. Rack location definitely can make or break the shopping experience. I love Stanford Shopping Center in Palo Alto for their bike rack locations. Which city/neighborhood are you talking about with the Target by the bus stop and the TJ’s by the Baskin Robbins? I work in Almaden Valley. Costco and TJs are in the same strip mall. I live in Blossom Valley and the new Target has a bus stop directly in front of it. They have a lot of bike parking, but it is out of sight from the doors. Great article and an even better idea! Great to read this. A few years back i kept track of how much I biked home from the store. I was curious to see if I could bike a ton in one year. I did. 2 tons the next year. Since then I stopped tracking. My favorite is when I filled the panniers up and then strap a 30lb bag of dog food on top. I love the idea of tracking cargo carried by weight. It’s like Strava for transportation cyclists! The heaviest cargo I’ve brought home was about 70 lbs in my trailer and 40 lbs on my Dutch bike. Did you feel the frame flex when you put the 30 lbs of dog food over your other purchases? I find each of my bikes has its limits. I once brought rocks home for a rock garden. It took a few trips. I had a bunch of spokes break a week later. Probably related. Just found your site today from a comment you made on the Atlantic about women, fashion and bikes. My wife and I gave up our car last summer after it broke down one too many times. The first thing I did was turn my old Kona mtn. 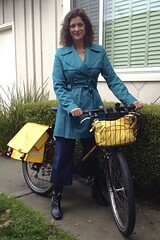 bike into a commuter and then bought a burley trailer for me. We got her a heavy duty rack with paniers. We average about 60 lbs a week on our 7 mile round trip grocery excursion. There isn’t much we can’t haul between the two of us. Do you have a photo of that? Must have been amazing. I bought a Yuba Mundo cargo bike in June, 2014. I live in a suburban town (ElkGrove,CA) and try to do all my errands with the bike. So far, my heaviest load was 14 gallons of drinking water. Once I delivered 35 lbs of apples to the food bank, recycled e-waste at the hazardous waste disposal facility, bought nine gallons of water, and dropped off donations to Goodwill. 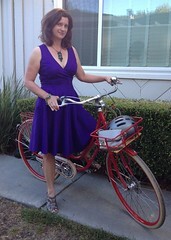 Love the bike and love not using my car.